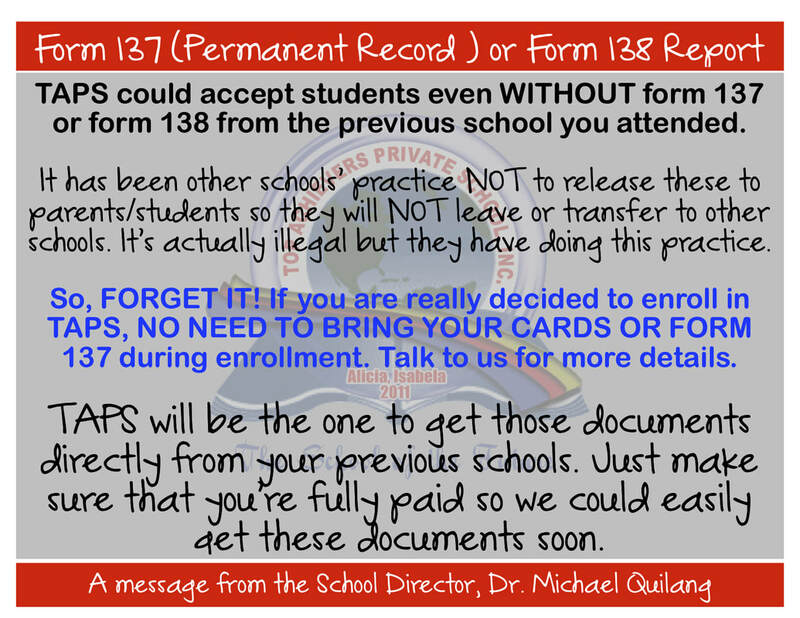 FOR MORE DETAILS ABOUT TAPS, please visit our Registrar's Office. Discount on Tuition Fee may be granted. Pupils who enrolled during our 1st year of operation (SY 2011-2012) will enjoy 30% discount on Tuition Fee until graduation in Grade 6. Pupils who enrolled during our 2nd year of operation (SY 2012-2013) in Grade 5 or 6 will get same discount (30% on Tuition Fee) until Graduation in Grade 6. GENERAL RULE: The discount granted to you (in percent) during your entry at TAPS shall be granted until you graduate in the same Department. NO OTHER MONTHLY FEES TO BE COLLECTED…! NO HIDDEN FEES…! NO COLLECTION ON ELECTRIC BILL…! NO COLLECTION ON OTHER MATERIALS…! NO COLLECTION ON EXAM PAPERS…! NO COLLECTION OF UNREASONABLE FEES…!